due to the rising multiplex theaters and the actual images which replaced the old-style cinema artwork from the 1990.
remaining firm of its kind in Korea. No jobs seem to be permanent. Jobs that flourished once would eventually disappear, leaving behind confounded workers. To shed light on this, in a cultural aspect, the National Folk Museum of Korea has recently published three books featuring jobs ? 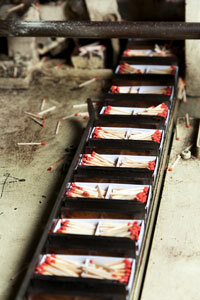 match manufacturing, wall painting, dyeing and traditional fishing. The books are ?Uiseong Seonggwang Match Manufacturer and Playhouse Wall Painter Baek Chun-tae ? Jobs That Are Being Lost,? ?The Dye Expert Lee Byung-chan?s 30 Years Life for Dyeing? and ?Traditional Fishing Techniques and Fishermen of the East Sea.? ?Uiseong Seong-gwang Match Manufacturer and Playhouse Wall Painter Baek Chun-tae ? Jobs That Are Being Lost? features the match manufacturing company, which is the only remaining firm of its kind in Korea, and the life of a theater signboard painter. The company was first established in Uiseong, North Gyeongsang Province in 1954 in the aftermath of the devastating Korean War (1950-1953). It was the only factory in the region where agriculture was the primary economic activity, and thus offering jobs to the young. The company flourished in the 1970s and the ?80s in the hey days of industrialization. But in the late 1980s, the advent of heating and cooking systems and wide use of disposable lighters spelt the industry?s decline. The number of employees shrank to 11 in 2012, from the peak of 270 in the 1970s. The book illustrates the brief history of the company, the processing tools and the changes of the lives of its workers. The book also highlights Baek Chun-tae, a theater mural painter who lost his stance due to the rising multiplex theaters and the actual images replacing the old-style theater artwork from the 1990s. Baek gave up college because of financial difficulty and started working at a theater as an assistant painter in Incheon, west of Seoul. At that time, the job was fascinating as the signboard art actually determined the success of the films in the 1960s-70s. And each theater had its own style. In southern part of the nation such as Busan, film posters and signboards featured rough brush touches while dark and subduing colors dominated the painting styles in Gwangju and Jeonju regions. Undoubtedly, Seoul was the center of the mural painting styles in fineness and aesthetics. So he decided to learn painting in Seoul at the age of 22. In Seoul, a hub for culture and art, he worked in Jungang Theater. His debut work in Seoul was the signboard painting of the American film ?Madame X? and then he moved to Dansungsa, the first movie theater in Korea. In Dansungsa, Baek reached his peak by generating numerous paintings of films which ended up being big successes. However, after a 40-year career, he faced a crisis as the multiplex theaters sprang up and real images replaced the paintings in the 1990s. 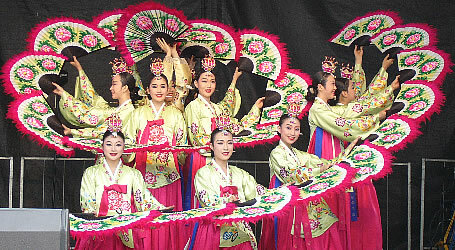 With the last piece in 2000, Baek left Seoul and went to Danyang, North Chungcheong Province in 2002. He said that at that time, he couldn?t endure such a drastic change in Seoul where his paintings were very common displays on the signboards of theaters. ?The Dye Expert Lee Byung-chan?s 30 Years Life for Dyeing? 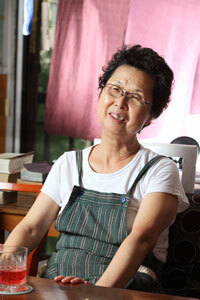 portrays the life of Lee Byung-chan who has devoted her life to dyeing using natural ingredients. The book is based on her individual case as a special professional that has conducted dyeing experiments over the last 30 years. ?In traditional society, dyeing was mostly done in houses. But in the modern times it has almost disappeared. 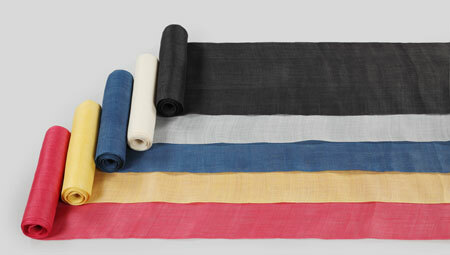 Lee has tried to recover the dyeing tradition with her own efforts using native plants,? Park Hye-ryeong, curator of the museum, said. Her founding and dyeing tools were donated to the museum as she couldn?t sustain the job anymore. ?Traditional Fishing Techniques and Fishermen of the East Sea? introduces fishermen who caught pollack and gathered seaweed in a traditional way on the East Coast, which was a major means of living in the region in the past. But from the 20th century, the two fishery techniques have been rapidly declining. Collecting seaweed has two different methods ? by divers and from a boat. The seaweed gathered by divers is still used in many parts of the nation but the on-the-boat technique is rarely used lately. Pollack has been one of the most favorite fish for Koreans. But the amount caught inshore has dramatically decreased beginning in the 1990s. The book documents traditional skills and tools through interviews with fishermen who worked in the mid and late 20th century.